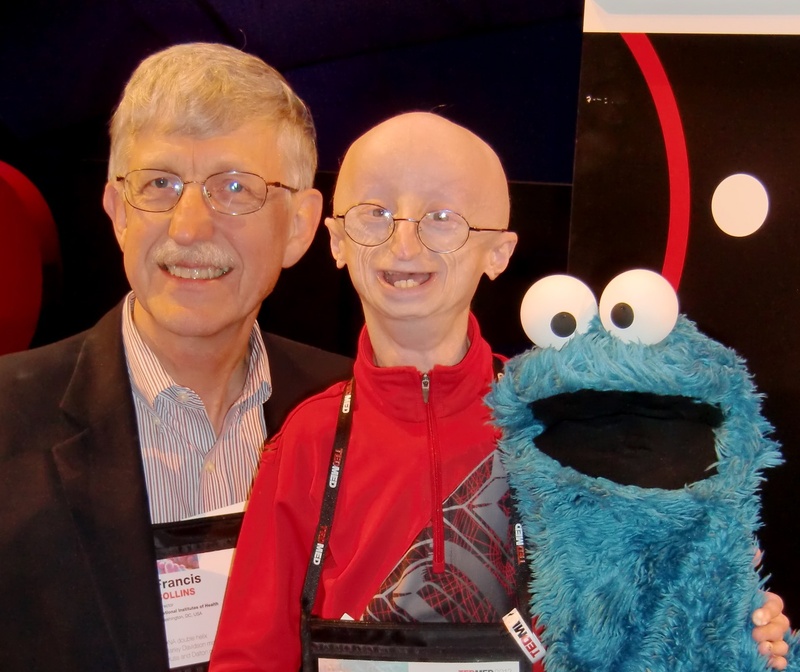 Sam Berns (center) with Cookie Monster and me at TEDMED 2012. This weekend, in a heartbreaking phone call from his parents, I learned of the death of Sam Berns, a courageous young man with Hutchinson-Gilford Progeria Syndrome. Sam may have only lived 17 years, but in his short life he taught the rest of us a lot about how to live. Sam’s parents, Scott Berns and Leslie Gordon, both physicians, introduced me to Sam more than a decade ago. At that time, no one knew the cause of this extremely rare disease that causes children to age at a dramatically accelerated pace, leading to death from heart attack or stroke at the average age of 13. Initially, I sought to provide them with some advice about how to encourage more research on progeria, but before long my own research lab began working on the problem—and 10 years ago, working with Leslie, we found the cause: a single letter misspelling of the DNA code in a highly vulnerable place in the genome. Almost all children with progeria had that same exact glitch. Working with Leslie, Scott, and Sam’s aunt Audrey, who together had formed the Progeria Research Foundation, and building on decades of basic science, progress has been unusually rapid. We figured out that the DNA mutation results in a toxic protein (named progerin), developed animal models for progeria, and tested a possible drug that was originally designed to treat cancer, but had the right properties to reduce the amount of progerin. That fortuitous circumstance allowed the initiation of a clinical trial for progeria kids (including Sam), just four years after the discovery of the genetic cause. In the fall of 2012, it was possible for Leslie and her team at the Dana-Farber Cancer Institute in Boston to report that this treatment had led to improved cardiovascular status for the kids receiving it. Sam was featured as the narrator of a recent television documentary, “Life According to Sam,” which premiered on HBO this fall, recounting the amazing story of this medical research adventure. These advances also began to take on larger significance. From research in our lab and others, it became increasingly clear that the toxic progerin protein is also being made by each of us—just in smaller quantities and at a later stage of life. Sam and other kids with progeria were teaching us that normal aging is not just a running down of the body; aging is an active process, with progerin serving as a major player. Meanwhile, Sam was growing up—a precocious kid with an aptitude for engineering, a talent for playing the drums, and a love of Boston sports teams. He was determined not to be defined by his diagnosis, or by his small stature and aged appearance. Barriers that might have seemed insurmountable to outside observers were never so to him. This straight-A student sought and won a place as a percussion section leader in the Foxboro (MA) High School’s marching band, even designing special equipment to make that possible. You can learn about all of Sam’s inventive strategies, and about his optimistic philosophy of life, by watching the TEDx MidAtlantic presentation he made just a few months ago. Through these years of hopes, struggles, and dreams, Sam became my friend. 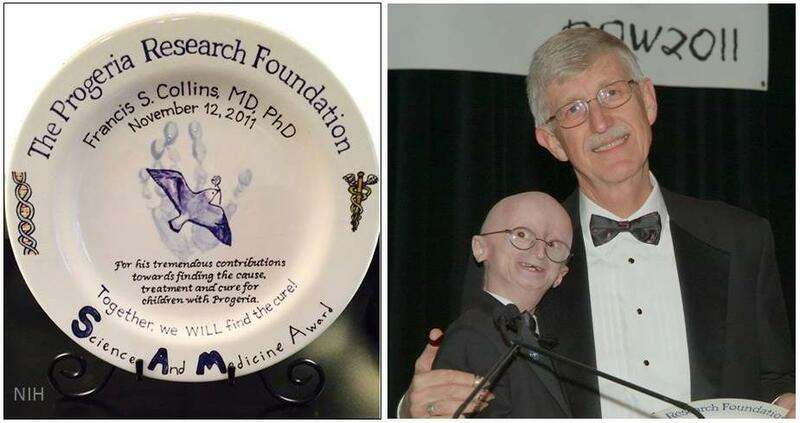 In November 2011, he presented me with the “SAM” (Science And Medicine) award from the Progeria Research Foundation. It is a hand-fired plate, with the inscription in his handwriting, and including a DNA double helix, a caduceus, and Sam’s own hand print. This plate sits on the shelf in my home office where I see it several times a day, reminding me that medical research is not just an academic exercise—it is about real people whose hopes and dreams depend on us. When I was asked to speak at TEDMED 2012, I wanted to focus on the opportunity to translate the deluge of basic science discoveries about the genetic basis of disease into new treatments. But the topic needed a human face. So, I invited Sam to join me to tell his own story of how being part of clinical research had affected him. He skipped school that day to travel to the Kennedy Center in Washington, DC, and he was simply brilliant. While the development of a treatment for progeria has been an amazing journey, and may have given Sam a few extra years of life, my heart aches today that we have lost him at far too young an age. Our journey is clearly far from over. More ideas about treatment are in the works. My lab and I are committed to continue the struggle in Sam’s memory. But beyond the ways in which Sam inspired all of us to seek answers in research, he also taught us to cherish every day as a gift. In the rush of deadlines and challenges that make up today’s world, I confess that I don’t always succeed at that. But those exhortations will come back to me each time I look at Sam’s handprint on that plate—and I will be thankful for the privilege of having known this remarkable young man. Medical research has lost one of its wisest and most endearing voices. Good night, sweet prince. You remain alive in our hearts. What a fitting tribute to a remarkable young man and such a great reminder about the importance of NIH Research. I could not agree more about the importance of NIH Research. I never met Sam or his family, but was very fortunate to have seen the documentary. Sam was quite the young man. He has inspired all of us to continue our research endeavors to help the human condition. What a wonderful tribute to this absolute treasure of a young man. I never met Sam, but I can feel his resolve in the words. RIP Sam, your life had meaning, your lessons will live on, and thank you for all you have done for rare diseases. A very touching tribute to a very special young man. We share our grief with Scott, Leslie, Dr Collins, the people who were privileged to know Sam and the world of people who heard Sam’s voice. It is impossible to grasp the effect Sams’ life and voice and that of his parents and friends have had to stimulate the research so needed to understand aging and how to live as we age. The world is better because Sam lived and walked among us. We will be forever thankful. A lovely tribute. Thanks to all that you and your colleagues and Sam’s parents have done and are doing to help these patients. Awesome!! Peace and God’s speed to the family. Thanks Francis … it is so important that we all remember that this is not about statistics and groups … but about people. Sam captured that, and so did you in your tribute. We are honored to have had Sam for his too-short years as a rare disease ambassador — and honored that you lead the NIH as we keep up the work in Sam’s honor and all with diseases that need research, improved clinical care … and cures. I am proud to have worked at the NIH. Keep your eye on the prize: An end to suffering. Dr. Collins, sorry for your loss and thanks for sharing this with all of us. It is amazing to see how unknowingly Sam moved science a step or two further. I was in tears the whole way through Dr. Collins’ tribute. All my very best to the dear family and friends of Mr. Berns. Memories endure. Great tribute to this lovely young man and feel really sad he is no more. But I have a question to Dr. Collins, as I have a kid with a rare genetic disorder and the unpredictable and unknown future that comes it. I have been watching for the last 10 years, there is NOTHING new that came out in the last 10 years as far genetic/medical breakthrough is concerned for my son. Any idea on how long before we see some new treatments for people? Thank you Dr. Francis.. R.I.P Sam..
Sam’s all too short life has touched more people’s hearts than he will ever know. His outlook on life and his attitude of “looking forward” may be hard for any of us, but it is worthy of a damn good try. He showed us that happiness can be found in even the toughest situation. RIP Sam. I thought I saw a bright new star in the heavens. Sam looking down upon us, smiling, twinkling away as he did in life. I had the pleasure of meeting Sam a few years ago while at NIH with my son, who was participating in a different research study headed by Dr. Porter. Sam was such an inspiration! I watched HBO’s Life According to Sam just this past weekend, and was not aware he had left us until just now, and the news broke my heart. RIP Sam, you will always be remembered by many. Thank you, Dr. Francis, for your dedication to the research and for this beautiful tribute to Sam. REST IN PEACE, SAM. YOUR’E IN GOD’S ARMS NOW. I saw the HBO special about Sam and others with this disease. I’m so sorry to hear that he has passed on. He was an inspiration. He did a lot with his short time on earth and chose not to let his disease limit his spirit. God bless him. My husband and I were there when Sam gave you the award, and we could see the love you shared. He was such an inspiration to our daughter, who bravely agreed to let Sam post her on his billboard project. He definately earned his Eagle badge and he is now soaring high. But we are mourning(doves). Thank you for all you have and will have done.